Experiencing Breathing Problems During Sleep? Americans are notorious for sleep deprivation, with over a quarter of the population reporting they don’t get enough sleep. But is your afternoon drowsiness the result of normal fatigue or could it be a more serious condition known as sleep apnea? Mid Wilshire Dentistry is here to help you tell the difference. Sleep apnea is a sleep disorder where a person’s breathing is interrupted during sleep. When left untreated, this repeated stopping and starting of breathing limits the brain — and the rest of the body — from getting enough oxygen as you sleep. 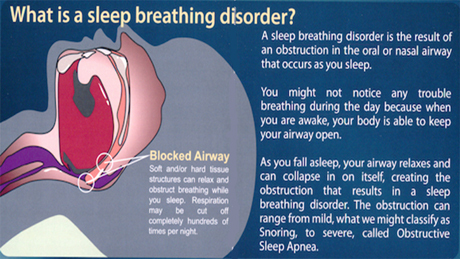 Obstructive sleep apnea (OSA): The more common of the two types of apnea, OSA is caused by a blockage of the airway. Typically this occurs when the soft tissue in the back of the throat collapses while sleeping. Central sleep apnea: Unlike OSA, which is a physical condition, central sleep apnea occurs when the brain fails to signal your muscles to breathe at night, due to instability within the respiratory control center. Dr. Laska is a premier provider of oral appliance therapy. We’ll customize our oral appliance therapy to suit your individual needs, matching for your mouth shape, size, and we’ll even let you choose your color preference. Oral appliance therapy (OAT) is a quiet, comfortable, and economical treatment for sleep apnea sufferers. Dr. Laska provides accurate diagnosis by either take home test or via sleep lab. Once diagnosed, we’ll identify the right method to help you breathe better and enjoy more restful, consistent sleep. Traditional CPAP machines can generate a significant amount of noise. They’re bulky, and downright uncomfortable at times. An estimated 85% of people who equipped with CPAP cannot tolerate wearing it, impeding treatment. • Mandibular advancement devices (MAD) — holds lower jaw forward, stabilizing the collapsible part of the airway. Over time, this appliance also strengthens the airway, exercising the tongue and other muscles used for breathing. • Tongue retaining devices (TRD) — hold the tongue forward during sleep, preventing it from obstructing the airway. It’s a customized monobloc oral appliance designed for obstructive sleep apnea (OSAS) treatment. Improve your quality of life without compromising anyone else’s sleep with Mid Wilshire Dentistry custom oral appliance therapy. We’ll determine the best course of action to treat your concerns. Sleep apnea is a serious issue and is often left undiagnosed. If you’re exhibiting any symptoms of sleep apnea, please don’t hesitate to contact Mid Wilshire Dentistry at (213) 550-2357 and schedule your initial consultation today.